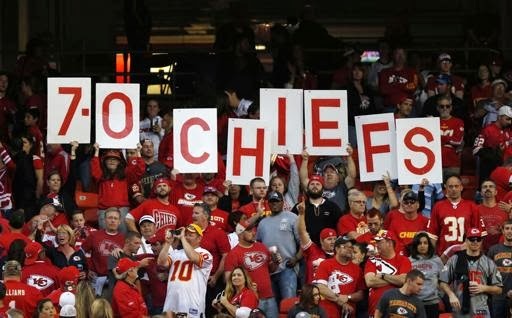 There is only one undefeated team remaining in the NFL and it is (drumroll, please) the Kansas City Chiefs. One year from having the worst record in the league, they have brought in a new coach, a new quarterback, and bada bing, the kids are 7-0. Can they move on to 8-0? Or can the Browns go into Arrowhead and pull off an upset? Here are my week eight picks. The Panthers may be the epitome of the club that is quite hit-or-miss, but they have been hitting the last couple of weeks with a pair of strong victories over the Vikings and the Rams. And it is a good time to take on the Buccaneers, who have seen the wheels just about come off. Greg Schiano is just trolling everybody right now and their myriad offense is going up against a very strong Carolina front seven. The Panthers are my Lock of the Week. Did you know that the Jaguars have still failed to score a touchdown in any home game this year? They have scored a hearty 11 points this year at home. That's a disgrace and proof that this team is a complete mess. And while this is a technical home game across the pond, they are well on the way to getting their rears handed to them by the Niners. Lord have mercy. We should have plenty of passing yards in Motown this week considering Tony Romo and Matthew Stafford sure can sling it and neither club has shown any ability in slowing down opposing passing attacks (Dallas: 29th; Detroit: 28th). So a shootout we will have but I think the difference maker will be Detroit's Reggie Bush as he will give Detroit enough of a pop that Dallas will lack to keep the Cowboys at bay just enough. The Eagles could not stop Chuck Cooperstein with their pass defense but at least they will not have to play Matt Barkley after his miserable debut last week as Michael Vick will be under center. How healthy is Vick, however, and he has not exactly been consistent either, so we may see more of the same out of them. New York finally got off the schneid on Monday night against the Vikings and while they still have many a flaw, this feels like a chance to salvage some pride on their end. Can somebody explain the Buffalo Bills to me? I don't get it. They have been 2-0 with Thad Lewis under center, and against two solid teams nonetheless (although the Dolphins are sliding) and I don't get how they do it. I am a Doug Marrone fan and he has this club playing well. And if they go into the Superdome and take out a strong Saints team, coming off the bye, that'd be very impressive. I am not seeing it though and Buffalo will come back to Earth this week. The new rule regarding pushing a player into the line on a field goal attempt led to the Patriots falling to the Jets in overtime was introduced for the first time on Nick Folk's missed field goal and thus Folk got another chance and he nailed it. Besides the fact that I doubt that that call had not been called at all this year until now, and then you call it for the first time on a big time situation play there, nobody knew that rule including the Patriots themselves as Bill Belichick admitted they had coached players to do that, not knowing of the rule because it had never been implemented. Of course, you got the mongos that think the Patriots cheat everywhere and the league lets them get away with it and all that nonsense. Meanwhile, the Dolphins are heading south fast and this is a ripe opportunity for New England. The Browns are at least making it interesting, but with how erratic Brandon Weeden has been in 2013, that is going to hinder them all year. And if Jason Campbell ends up getting some action (and you know he will at some point), even better. And therefore, the Chiefs get lucky once again. Kansas City is a fine club, but they also have played an awful schedule. Case Keenum almost beat them. After a disastrous start, Pittsburgh has put themselves back in the AFC race with three wins in a row over Minnesota, the Jets and Baltimore. The offense, save for the game against Minnesota, has not been great but the defense has really stepped up and has brought their season back from the dead. But it seems like funky things happen when the Steelers play the Raiders, and Oakland has not lost to them at home in almost 20 years. Give me Oakland. Let's be honest, the Jets were lucky once again and it helped them to a big divisional win. Then again, they weren't that lucky because they did work the refs on the field goal stuff and it worked out in their favor, and there isn't anything wrong with that. However, there is a lot wrong with this. I am not sold on them this week against Cincinnati because first, it's the off week for the Jets in that they follow a nice game with a sloppy one, and Geno Smith will struggle against the Bengals' defense. Thankfully, Washington plays in an awful division as they are still alive in the NFC East, and they got a big win over Chicago thanks to Roy Helu's three rushing scores and another excellent performance by Robert Griffin. They are going to have to engage in shootouts to win their games with how awful their defense is, but that is not a great strategy going up against Peyton Manning and the awesome Denver passing attack. When the Falcons needed a win the most, they put their eggs in Matt Ryan's basket and boy did he deliver with a sterling performance that carried the Falcons over the listless Buccaneers. Can they do it again against an inconsistent Cardinals club? I think not. Their pass defense will allow Carson Palmer to put up a lot of yards and it will be Arizona, not Atlanta, that gets a crucial stop late. How about that. Green Bay was worried when the club went into the bye with a 1-2 record but they have reeled off three wins in a row thanks to a much-improved defense (even with Clay Matthews out) and a significantly better running game thanks to some solid play from Eddie Lacy among others. And with Minnesota's issues at quarterback, Green Bay should be a nice favorite but considering things are always tight between these two, particularly in the Metrodome, do not count out the Vikings to make this a game. Anytime you have got Kellen Clemens under center, great things are going to happen...for the other guys. With Sam Bradford out for the year, Clemens is going to be the guy for now for the Rams and that means the team is done without any question. And therefore, it is a great week to play the Seahawks, who just may eat Clemens alive. Literally.